The benefits of 7 Speed Reading™ and the central role that reading speed plays in business and education today are highlighted in a new blog post by eReflect’s editors. The user-friendliness of the program and the targeted approach it takes to eliminate regression and subvocalization are among the top merits the program offers. ...replace bad reading habits with time-efficient and knowledge-promoting ones. eReflect, Ed Tech solutions provider and developer of 7 Speed Reading™, shares the science behind the program that makes it possible for learners to replace bad reading habits with time-efficient and knowledge-promoting ones. The learn to speed read program has been designed by experts in order to facilitate the user's efforts in discarding unhelpful reading habits and learning new, time-efficient ones. According to eReflect’s editor, the program’s developers used the latest technologies and advances in education to design a complete learning experience for people who want to conquer more knowledge in less time in an information-centered world. 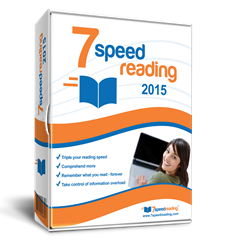 The experts working on 7 Speed Reading™ assert the program can help any learner improve their reading speed by 3.4 times, a statement that both vouches for and validates the science-based design of the program as a whole. One of the most significant benefits of the program is its thorough and targeted approach toward the elimination of bad reading habits. The program offers easy and fun to use activities that help learners eliminate regression and subvocalization — reading habits favored by teachers and students when those students were first exposed to reading. The elimination of such bad and ineffective habits prepares the learner for the adoption of more time efficient skills. eReflect’s reading improvement program pays due attention to user support to ensure the learner has the material and information necessary for an enjoyable and constructive learning experience. To this end eReflect offers video tutorials, step-by-step instructions, and user support throughout the program’s activities to make sure the learner can improve their reading speed and retain high levels of reading comprehension. 7 Speed Reading™ has another benefit that make it truly competitive, the eReflect editor notes. The program is known and loved for its all-inclusive approach to speed reading. While online sources and tutorials offer a few approaches to reading faster, the program makes sure the learner gains a deep-level restructuring of their reading habits which touches upon eye fixation, cognitive processing, memory acuity, and of course, reading speed and reading comprehension.